We understand that quality is the customers greatest concern, and we strive to always make quality come first in all that we do. Management at Lewis Engineering understands that a metal component is worthless to our customers if it doesn't meet every specification and dimension shown on the drawing. Before our staff begins to cut metal, we carefully read the customer provided drawing to ensure we understand everything it states. During the production process, the quality control staff constantly strives to be sure that all products exactly match the drawings they are made from. We understand your component was designed a certain way for a reason, and we manufacture it the way you intended. Our internal Quality Policy listed below portrays our belief in and committment to good quality products and services. Every Lewis Engineering Company employee accepts responsibility for putting the needs of our customers first, maintaining a safe work environment, and providing continuous improvement. 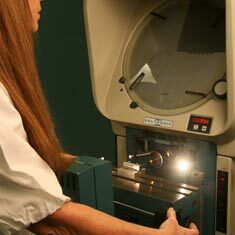 Lewis Engineering believes in investing in state of the art equipment to check the quality of your machined or stamped component after it is fabricated. 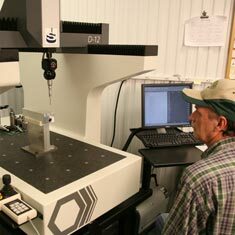 We have a quality control lab equipped with a coordinate measuring machine, optical comparitor, calibration system, height gages, and custom made gages built for your specific job. We utilize this equipment on every order to insure that only conforming parts arrive at your doorstep. We know that our customers don’t have time to worry about scrap, so we strive to never let it leave our facility. Many of our customers require quality measures above and beyond the average job; we are ready for this. The quality department is accustomed to providing first article samples, 100% inspection, running SPC, packaging so that components can’t be damaged, and providing material and plating specifications. Since Lewis Engineering has been a subcontractor to the Department of Defense sine 1961 we are very familiar with all the “red-tape” that is involved with government contracting. Our quality personel are also very familiar with military, AMS, and ASTM specifications.